Another Tuesday and another challenge at Stamp Ink Paper. Here's our sketch. I'm using some Affectionately Yours designer paper on my layered Butterfly card, which I have combined with cardstock of Watermelon Wonder, Blushing Bride, Sahara Sand and Blushing Bride Glimmer paper. Here's a closer look at the layers. I love using my Butterfly thinlits, along with punch and circle dies. I also got to use new Banner Bundle consisting of punch and co-ordinating thoughful Banners stamps. Thanks for joining us for our sketch at Stamp Ink Paper. We are looking forward to having you play along. Have a great day. This is a card I created featuring the Botanical Gardens designer papers which was made at my last class. Looks familiar you say? Yes I used the Paper Craft Crew sketch from a previous challenge when I made a card for a friend of my daughter. The cardstock I've used for this one is Pear Pizzazz, Whisper White and Basic Black. The patterned papers are from the pack called Botanical Garden which is only available until the end of May when this current Occasions catalogue ends. I've used the Number of years bundle to cut the numbers and stamp "again" on the Oval die. I love this one. Hope you are having a good weekend. See you next time. 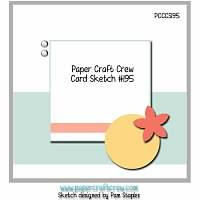 Welcome to our Wednesday card sketch challenge for this week at the Paper Craft Crew. Here's our sketch. We can't wait to see what you do with this one. I decided I needed another male card, so I've used Sky is the Limit, Gorgeous Grunge and Thoughtful Banners stamps and the matching banner punch for that set. A little sneak peak with my preorder of new products. The cardstock is some retired Not Quite navy with Very Vanilla and the pattered paper is from the stack called Going places. Here's a closer look at the detail. I kept it simple and I'm happy with the result. What do you think of it as I welcome some feedback? Make sure you visit and see what our other members made. 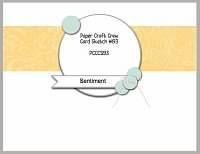 We hope you will join us for the challenge at the Paper Craft Crew. Happy Tuesday to you all. 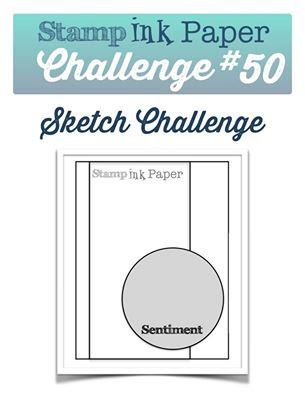 Here's our next challenge at Stamp Ink Paper to feature flowers. I've used the Flower Patch stamps combined with matching Flower Fair framelits here and I'm also providing a sneak peak to some of our upcoming catalogue products by stamping with some of the In Colour Ink range and the Affectionately Yours designer paper that I've used on the background. The cardstock I've used is Mint Macaron and Whisper White. Spring Flowers embossing folder was used on the white background. Here's a closer look at my flowers stamped with new inkpads of Sweet Sugarplum, Emerald Envy, Peekaboo Peach and Flirty Flamingo. 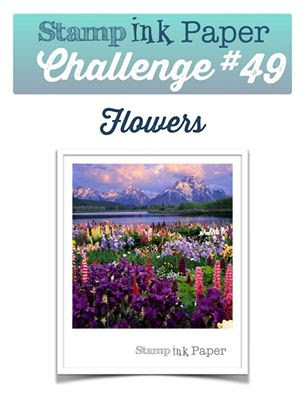 There are so many floral options that it was difficult to narrow down which products I was going to use, but I think this will be a popular challenge and we look forward to seeing your card. Thank you for joining us this week at Stamp Ink Paper . Have a great day. Welcome to the Wednesday Card Sketch challenge at the Paper Craft Crew. Here is this week's sketch. I have a craft fair this weekend and decided this would be an ideal opportunity to make a few cards with older stock to sell and in turn then have some additional funds to put towards my own upcoming new catalogue purchases. Here they are using cardstock of Soft Sky and Sahara sand for both cards and a small piece of Whisper White stamped with one of the images from Six Sided Sampler stamp set and punched with soon to be retired Hexagon punch. The paper is from a very old Designer pack called Fall Flowers and I've added a Dragon fly to the design, stamped with the set called Awesomely Artistic. Greetings are from Teeny Tiny Sentiments. Below is the first one. Sahara Sand lace and basic rhinestones were added to the card and I've used the Scallop border punch on the Sahara sand panel on the bottom edge. Here's a closer look. 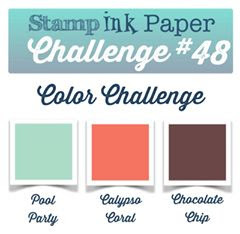 Happy Tuesday and welcome to our challenge this week at Stamp Ink Paper. 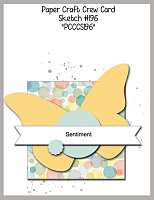 My card uses the Butterfly thinlits and cardstock of Whisper White, Wisteria Wonder and Blackberry Bliss. The stamps used are from the Butterfly Basics stamp set and are stamped with Blackberry Bliss ink. Thanks very much for stopping by today. 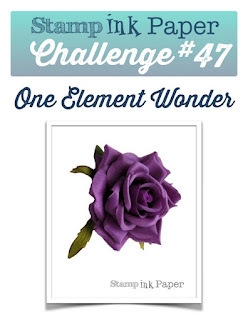 We are looking forward to seeing your One Element Wonder for our challenge this week at Stamp Ink Paper. Here's another butterfly card I made this week. 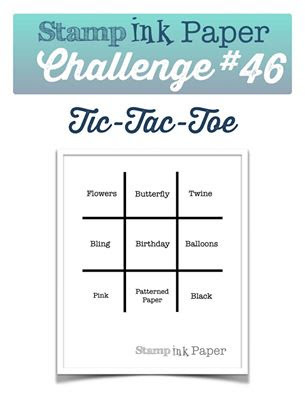 I couldn't decide which was going to be for the Tic Tac Toe challenge at Stamp Ink Paper. This one was my alternate card and it was Justin who helped me decide. I am actually quite please this how this one turned out too. The cardstock is Blackberry Bliss, Pear Pizzazz and Wisteria Wonder and the patterned paper is from the SAB pack called Wildflower Fields. The top layer of the Butterfly was stamped with the Basic Butterflies stamp set and both cut with the Butterfly thinlit dies. I'm so glad they are not retiring. Thanks for joining me. I hope you have a wonderful day. I had a Wedding to attend the other weekend. It was the second time around for both the bride and groom, a mature couple. It was lovely that all their extended families with their grown up kids and grandkids as well as friends both local and from around the world were able to attend, including their travelling companions, their Caravan club. :) It was truly a unique country wedding. This is the card I made for them with a Totally Taupe base, some embossed patterned paper from my stash, some lace and greeting from the Happy Notes stamp set which has been cut with the Lots of Labels framelits. Here is the full view of the card. I kept it simple and elegant. Thanks so much for stopping by today to see what I've made. Have a great weekend. Happy Wednesday to you. Here is his week's sketch for the Paper Craft Crew Challenge. I decided I would use the Tea Cup framelits on this card . It's the first card I've actually made with them for, purchased new from the Occasions catalogue and they are retiring already. I've combined them with the Deco Label and Bitty Banner framelits which are also on our retiring list. The cardstock I've used is Tip Top Taupe, Blushing Bride and Shimmery White. The Mother's Day greeting comes from the Teeny tiny sentiments stamp set and the background was embossed with the Lovely Lace embossing folder over which I placed some Sahara Sand lace.